‘Gastronomos’ is a cooking and baking magazine produced by one of the biggest newspapers in Greece. It comes out once a month and it is being sold along with the newspaper on the Sunday issue. Last Sunday the October issue was out and to my excitement it featured recipes from Thessaloniki. Needless to say I was very excited and asked my sister not only to get the issue for me but take photos of all the pages and send them to me. Later on I found the issue online so I also downloaded it from there. The basic characteristics of the Greek cuisine are identified with the used ingredients. The use of fresh mediterannean vegetables, olive oil, feta cheese, kaseri cheese, fresh fish and meat is the basic characteristic of the Greek cuisine. The recipes are very simple and healthy and make up a very balanced and healthy diet. Despite the uniformity of the recipes accross Greece each area has developed its own culinary identity as it basis its recipes on local products and specialties. I would say that it is one of the best countries for food tourism. Within Greece the basic characteristics of Thessaloniki’s cuisine are the strong use of spices and the influences from eastern cuisines. The geographical position of Thessaloniki, it’s openess to welcome population groups from all over the world, its occupation from the Ottoman Empire and the settlement of Greek refugees from Minor Asia have welcomed culinary influences from different parts of the world. Even though many of the dishes are very familiar to Turks, Armenians, Jews, Syrians, Lebanese etc they maintain their original local identity. Within Greece the cuisine is identified as the richest in quantity and quality and Greeks from all over the country visit just to taste it. This is one more reason why I love my city. Being born in a family that has been a part of Thessalonikis growth and history since its liberation from the Turks I was lucky to be exposed to every little cultural secret and the history behind it. In this blog I have already presented one of my favorites and most famous Thessaloniki morning treats ‘Mpougatsa’. 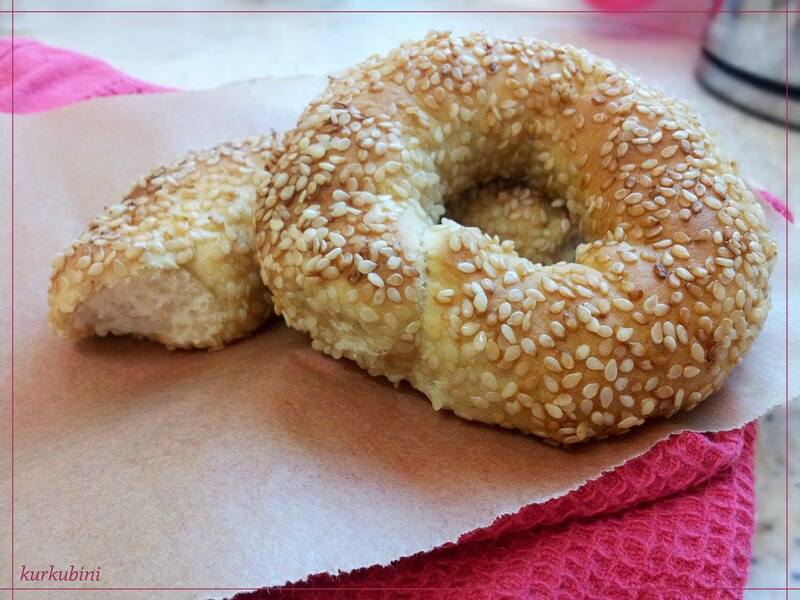 The second most famous morning treat is the ‘koulouri’ or the Thessaloniki version of the commonly known bagel. As always before making them I looked for more recipes and what I noticed is that they are all almost the same apart from the final stage. Following some other recipes I decided to add one more ingredient in the final stage. They turned out delicious and their taste is exactly the same as the ones I buy in Thessaloniki. What also surprised me is how easy and quick the recipe is. The only tricky part is that you have to plan it in advance as the yeast has to be left in water for 8 hours. In 100ml of lukewarm water we add 2 tbsp of the olive and dilute half of the yeast. We leave it covered for around 8 hours to sour a bit. After the 8 hours we repeat the process for the rest of the yeast and we let it aside for half an hour. In a bowl we mix the flour, salt and sugar. When both our yeasts are ready we pour them in the flour mix and add the rest of the water. We work the dough for about 10 minutes and add flour if necessary. The aim is to get a soft and elastic dough. We leave it to rise in a warm environment. I usually heat the oven in the lowest temperature and leave the dough to rise there. We divide it in 40g parts and then form round bagels with each small part. In a bowl we mix the honey or petimezi with the warm. We dip each bagel in the honey mix and then in the sesame. All sides of the bagels have to be covered in sesame. Preheat the oven at 200 C and bake for about 15 minutes or until our koulouria are golden. Variations: If we want sweet koulouria we can mix raisins in the dough or add nutella or chocolate as fillings. Savoury variations include koulouria with feta cheese fillings or koulouria with olives.